PDF restrictions have become more of a necessity than just an additional feature by Adobe. PDFs have become vastly popular in the online industry by being used amongst most major areas like; government sectors, schools, institutions, law enforcement, legal departments, online forms/reading material, etc. Owing to the significance of information stored by users in such and related areas, application of security is a necessity. Adobe already had the respective provisions made since its earliest versions via which security could be applied for many different purposes. In this blog you will learn about the same and how to remove PDF file restrictions so as to be able to control the security in your hands. Extremely powerful and rigid are the right terms to exactly describe the level of security provided by Adobe Acrobat for protecting PDF documents. Adobe itself has mentioned in most of its official pages online, that a password must be maintained separately in order to be retained forever. Without the correct password, there is no way to get past the security of a protected document and access its contents. Basically the security is classified into two categories that include a Document Open or better known as User Password and an Owner Password. 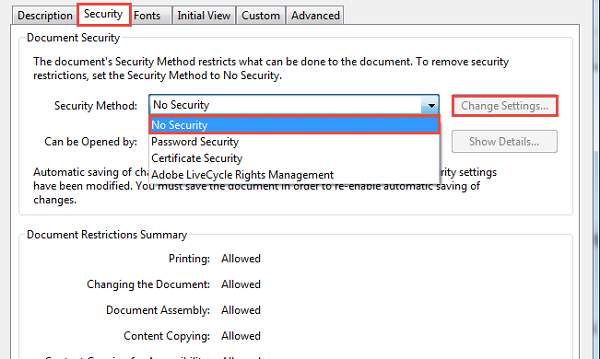 To entirely lock up a document, Adobe lets you use the document open password which is asked for immediately on opening a protected document. Therefore, whoever wants to view the document must be aware of the password. Whereas, there is another less secure password which only restricts certain functions on the document. Thus, if you try to perform something that has been restricted by the document owner, a password will be asked like; printing or editing a document. But viewing the document will be possible in this case. To remove PDF File restrictions you need Adobe Acrobat Pro and Correct password or best approach is to try Unlock PDF Tool. Introduction of security options in PDF were implemented by Adobe on the launch of its earliest of version and since then, it has been making improvements in it. 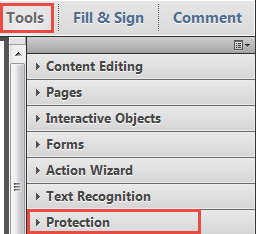 How To Remove PDF File Restrictions Protected With A Password? It isn’t necessary that the requirement of document security also makes it convenient automatically. A number of users are not comfortable providing a password every time they open a document. Thus, they end up removing security from the less confidential information storing documents. The following steps will help you in completely removing PDF file security restrictions from over documents that don’t necessarily require them. 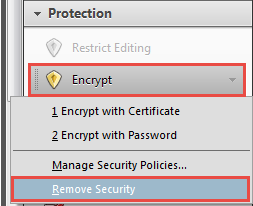 In it, click on Encrypt followed by Remove option. Now click on the Security tab and choose No Security and click on Change Settings. User Password: Click on OK and the password security shall be removed successfully. Owner Password: Type the correct permissions password in the provided field and click on OK to proceed. 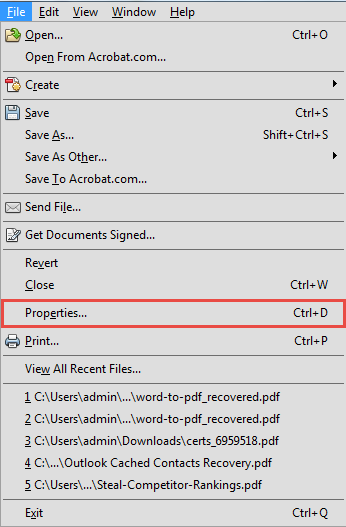 Again click on OK to confirm your action and remove PDF file restrictions. Calculating the Hash Value: People well versed with apt technical know how easily extract passwords by calculating the hash value. However, this is not a feasible option for every user and also, this would only work until Adobe version 4.0 and not afterwards as the later versions use 128 bit RC4 encryption for securing passwords. Using Online Workarounds: Uploading the protected document on Google Drive and downloading it in a converted form like as a Word file for instance has a 99% chance of cracking the password security and extracting the contents conveniently into the defined file type. Third Party Applications: Last, but not the least, the most dependable and highly popular last resort adopted by users is external applications that tend to legally break into documents by eliminating security applied on them. The password must be strongly built, i.e. should contain the combination of multilingual characters; alphabets, digits, and symbols, etc. Passwords ensure the security of document, to ensure the security of passwords; one must maintain it in a separate and safe manner so as to not lose access to it. At the end, it is the security that matters both while protecting the document as well as while unlocking it. Thus, the only safe way that offers to know how to remove PDF file restrictions is a third party application. One such is PDF Unlocker is mentioned at the top which is popular one in its arena and has been tested to offer foolproof solution with guarantee. Copyright © 2019 www.PDFUnlocker.org. | All Rights Reserved.